George played professional baseball as a young man. Primarily a catcher, he batted .203 combined in 1910 and1911 with the Kearney Kapitalists of the Class D Nebraska State League. Ejected from a game on July 25, 1910, he later confronted the umpire at a hotel and “attacked” him, for which he received a 30-day suspension.6 It was a harbinger of things to come. The incident forced Thomas Hickey, president of the American Association, to fire Magerkurth, yet Hickey recommended him to Harry A. Williams, president of the Pacific Coast League, who quickly hired him.22 Magerkurth did well in the PCL, and in November 1928 he was promoted to the National League. Though he rarely fought, Magerkurth had a reputation that he was willing to fight and it served him well. Feisty ballplayers and managers would argue with him, but they avoided physical contact with the big man. When two rival players would square off to fight one another, Magerkurth would step between them and they would back away. He was both arbiter and policeman on the ball field, and he would not be intimidated. After the 1947 season Magerkurth decided to retire due to leg injuries. “I’m now in the buffalo class,” he said of his 240-pound frame. “I could still go on — I’m only 59 years old — but the old knee says what’s the use.”42 In 19 major-league seasons he had umpired in 2,808 regular-season games, plus 22 games in four World Series, two All-Star Games, and hundreds of exhibition games. His final appearance was Game Seven of the 1947 World Series. 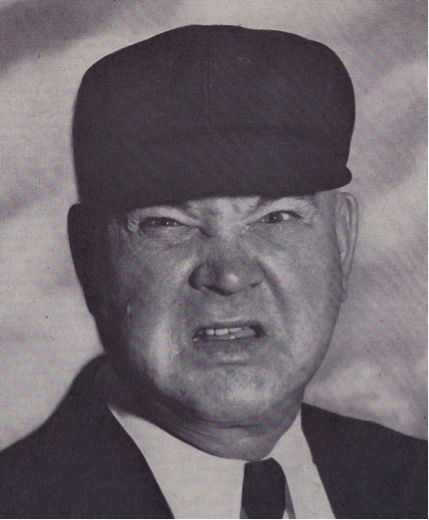 In his retirement, Magerkurth played cards every day in Moline, smoked fat cigars, and spoke warmly of Durocher, Frisch, and Stengel.47 The big ump died in Rock Island, Illinois, on October 7, 1966, at the age of 77. 1 Greenfield (Massachusetts) Recorder-Gazette, October 20, 1966. 2 New York Times, October 8, 1966. 3 Cincinnati Enquirer, April 17, 1939. 4 Wilkes-Barre (Pennsylvania) Record, June 11, 1940. 5 US Census, 1900-1940; Ancestry.com. 6 Nebraska State Journal (Lincoln), July 27, 1910. 7 Grand Forks (North Dakota) Evening Times, June 7 and 26, 1912. 8 Magerkurth was also a boxer as a young man. 9 Rock Island (Illinois) Argus, November 14, 1914. 10 Bloomington (Illinois) Pantagraph, January 1, 1927. 11 Rock Island Argus, June 15 and 22, and August 23, 1922. 12 Collier’s Weekly, June 27, 1942. 13 Bloomington Pantagraph, January 1, 1927. 14 Rochester (New York) Democrat and Chronicle, August 10, 1924. 15 Reading (Pennsylvania) Times, June 10, 1925. 16 Baltimore Sun, July 27, 1925. 17 Reading Times, January 17, 1927. 18 Louisville Courier-Journal, September 30, 1925. 19 Wilmington (Delaware) Morning News, July 7, 1926. 20 The Sporting News, May 5, 1927. 21 The Sporting News, January 21, 1948. 22 Oakland Tribune, May 12, 1927. 23 Collier’s Weekly, June 27, 1942. 24 Brooklyn Daily Eagle, July 23, 1931. 25 Brooklyn Daily Eagle, October 21, 1933. 26 Wilkes-Barre Record, June 11, 1940. 27 Collier’s Weekly, June 27, 1942. 28 Bismarck (North Dakota) Tribune, June 12, 1942. Magerkurth ejected Durocher from six games and Frisch from seven games between 1933 and 1946, according to Retrosheet.org. 29 Brooklyn Daily Eagle, August 5, 1946. 30 Oil City (Pennsylvania) Derrick, January 19, 1948. 31 Pittsburgh Post-Gazette, January 25, 1944. 32 Pittsburgh Post-Gazette, December 11, 1945. 33 Wilkes-Barre Record, July 17, 1939. 34 St. Louis Post-Dispatch, July 23, 1939. 35 Collier’s Weekly, June 27, 1942. 37 Rochester Democrat and Chronicle, September 18, 1940. 38 Brooklyn Daily Eagle, April 20, 1941. 39 Collier’s Weekly, June 27, 1942. 40 Cincinnati Enquirer, July 20, 1945. 41 St. Louis Post-Dispatch, July 21, 1945. 42 The Sporting News, January 21, 1948. 44 Pittsburgh Press, June 28, 1946. 45 The Saturday Evening Post, June 7, 1947. 46 Arizona Republic (Phoenix), April 1, 1951. 47 Pittsburgh Press, February 17, 1955.